The Johnson laboratory uses supramolecular chemistry as a tool to approach a variety of problems in organic, inorganic and environmental chemistry. Research topics include i) developing a supramolecular designstrategy for the specific chelation of hazardous metals such as arsenic, lead, and mercury; ii) molecular recognition of anions and biologically relevant small molecules, and iii) developing greener approaches to prepare metal oxide thin films for electronic device applications. Students can also participate in inorganic nanocluster synthesis within our Center for Green Materials Chemistry (http://uoregon.edu/~grnchem/). REU students would be introduced to concepts in the field of supramolecular chemistry and they will specifically apply the principles of self-assembly, molecular recognition, organic, and inorganic synthesis to prepare new molecules. 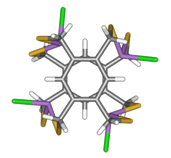 A representative project for an REU student would involve first learning the basics of computer modeling (molecular mechanics and DFT) to design a ligand capable of forming a nanoscale assembly in the presence of a specific toxic metal ion such as As3+ or Hg2+. Ligands designed from this work will selectively chelate the target toxic metal ion, enabling applications in environmental remediation and sensing of a variety of problematic environmental contaminants. The REU student would perform the organic synthesis necessary to prepare the ligand, the inorganic synthesis required to form the complex, and the characterization to prove the assembly composition (NMR spectroscopy, mass spectrometry, X-ray crystallography, etc.). This project will give the student a working knowledge of supramolecular chemistry, expose him/her to the basics of computer modeling, and provide hands-on organic and inorganic synthesis experience.